Formula One: Hamilton takes pole as Rosberg spins in tricky Chinese qualifying! 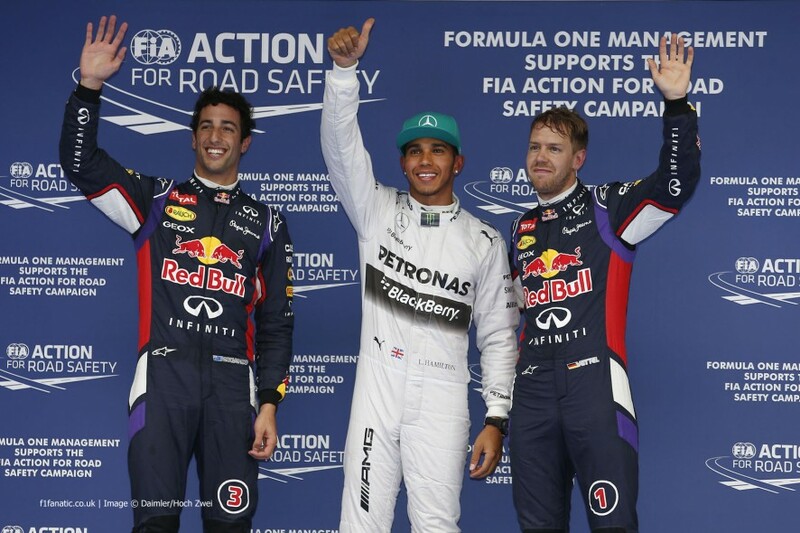 Home » Formula One: Hamilton takes pole as Rosberg spins in tricky Chinese qualifying! 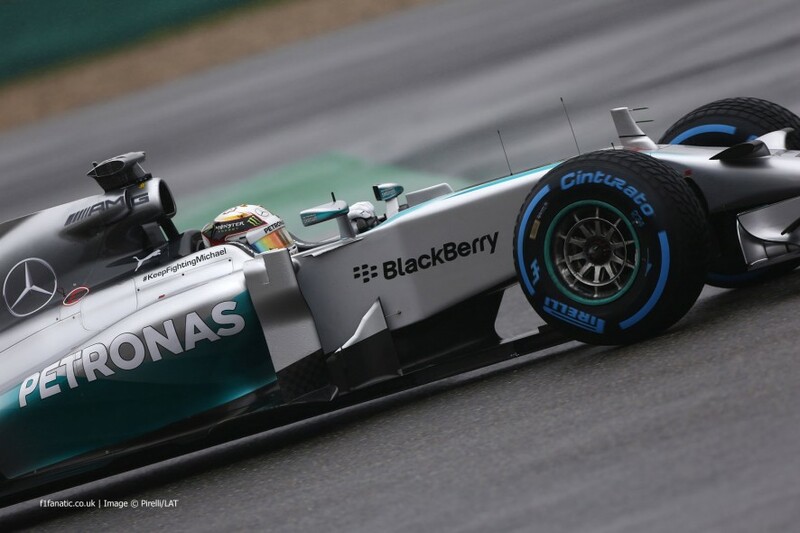 Lewis Hamilton has claimed pole position for the 2014 Chinese Grand Prix, his third pole position of the season. He out-qualified Daniel Ricciardo and Sebastian Vettel, with Nico Rosberg making mistakes in the final session to take 4th. 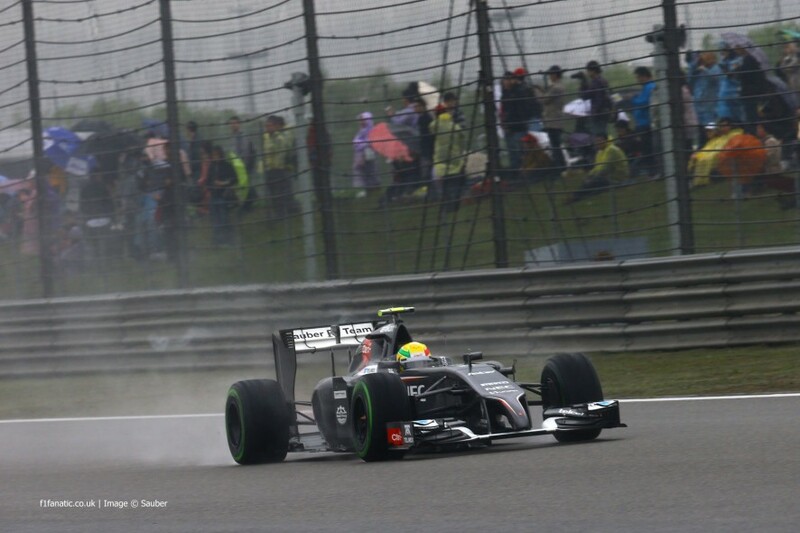 A wet circuit greeted the drivers at the start of qualifying for the 3rd time in the first 4 races this season. The track had been wet for the Free Practice session earlier in the day, with Daniel Ricciardo topping the session for Red Bull. The drivers began the session on the wet tyres, with Sebastian Vettel initially setting the pace before Hamilton displaced him from the top of the time-sheets. Toward the end of the session, the track dried sufficiently for the drivers to make the switch on to the intermediate tyre. Adrian Sutil used this to good effect, as he had previously been in the drop-zone before improving on the faster tyre. Jean-Eric Vergne was briefly pushed down into the drop-zone, before elevating himself into the next session. This left Esteban Gutierrez to be eliminated, along with the usual suspects of the Marussias and the Caterhams. Pastor Maldonado was not able to emerge in the session. The Venezuelan had suffered a tricky weekend so far, which continued in final practice when he suffered a mechanical problem. The repair job was too much for Lotus to complete, which meant that Maldonado, who would have had a place grid penalty for his collision with Gutierrez in Bahrain, will start from last in tomorrow’s race. The weather continued to fluctuate from better to worse during the second qualifying session. Adrian Sutil was one of the first to set a time, before Hamilton blasted through, a full four seconds faster than the Sauber driver. Lewis ended the session as the fastest man, with Vettel a mere few tenths behind; evidently closer in the wet conditions. Nico Hulkenburg was on the edge of being eliminated in the session, with the Force India driver in the last place to advance into Q3. It looked as though he would be beaten, until last minute rain caused the lap times to lengthen, with Nico being safe. The rain also helped Romain Grosjean, who managed to secure Lotus their first Q3 qualification of the season after a torrid start to the season. 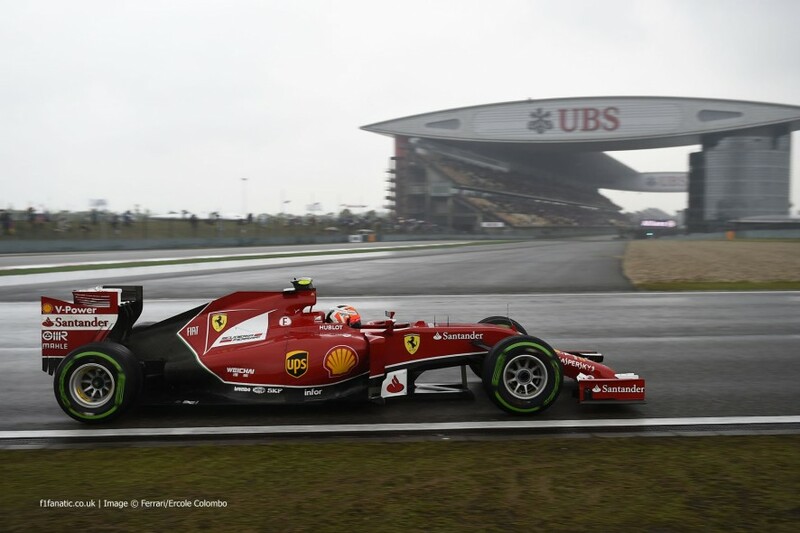 Grosjean’s surprise advancement put pay to any mistakes from other drivers, with Kimi Raikkonen failing to advance after a down-shift problem in his Ferrari. The two McLaren drivers failed to advance also, with both Button and Magnussen complaining of a lack of grip on the Intermediate tyres. The rain eased slightly for the start of the top 10 shoot-out, with some drivers still choosing to head out on the wet tyres after the sudden down-pore at the end of Q3. Bottas, Vergne and Hulkenburg all emerged at the start of the session on the slower tyre, before moving to the intermediate compound. Vettel once again set the initial benchmark, with Hamilton following soon after to go 6 tenths faster than the Red Bull driver. Rosberg soon followed his team-mate to go into second at the end of the first run. The track seemed to have gotten faster for the drivers in the closing minutes of the session, with most opting for two flying laps to end the session. Ricciardo, Vettel and others started to set faster sector times than Hamilton, but the Mercedes driver put pay to any thought of someone beating him by producing a 1’53.860. Ricciardo could only manage to be within 6 tenths of the Mercedes driver, with Vettel another 4 tenths back. Rosberg had tried to cause an upset and steal pole position, as he had done in Bahrain two weeks ago, but on his first attempt he ran deep into the hairpin, causing him to loose to much time. He had one more lap, of which he was making gains on his team-mate, but he made a mistake at the final turn which saw him spin round. He couldn’t improve and had to settle for 4th behind the two Red Bull cars. Alonso took 5th place, 1.5 seconds off of the pole time set by Hamilton, with the two Williams taking 6th and 7th; an improvement on their previous wet qualifying performances. Hulkenburg and Vergne will line up 8th and 9th on the grid, with Grosjean getting Lotuses best start of the season in 10th place.